Shri Abhinav Kapadia, age 35 years, is the Chief Finance Officer at PDPU. He has more than 12 years of work experience in the field of Finance & Accounts. He has joined PDPU in the month of May 2014. Prior to joining PDPU, Shri Kapadia has worked with Gujarat State Petroleum Corporation Ltd (GSPC) in the Finance & Accounts Department. He has worked in the area of Corporate Finance, Overseas Fund Raising, Foriegn Exchange Markets, RBI Compliances, Taxation, Accounts, SEBI Issue & Compliances, etc. Academically, Shri Kapadia has done his Masters in Business Administration (M.B.A.) with specialisation in Finance. Further, he achieved the degree of Charated Financial Analyst (C.F.A.) from ICFAI and is also the Member of Institute of Company Secretaries of India. At PDPU, Shri Kapadia is heading the Finance & Accounts Department of the University. Prof. H. B. Raghavendra Completed his BE degree in Civil Engineering with distinction from University of Mysore in 1983. MS (research) degree is by IIT Madras in 1988 in the faculty of civil engineering. He completed his Ph.D. degree from IISC Bangalore in 1996. He is the recipient of several scholarships of government of India during his student days. He was also selected for fellowship by university of Singapore. 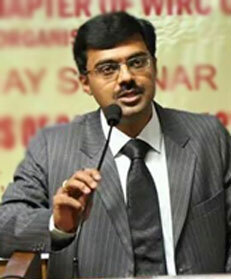 He completed his Masters degree from BITS Pilani in Software Systems in 2002. He is having 31 years of teaching, research and administrative experience. He published around 40 technical papers in National and International Journals and conferences. He visited abroad to present papers and lead faculty and student delegation to foster University collaboration. He is in the panel of referee’s for international Journals. He has delivered lectures at short term training programme conducted by premier institutions. He has guided many Masters and Ph.D. candidates and contributed as member of BOS and BOE of various universities. He has been member of governing council of technical institutions as vice-chancellor’s nominee. Presently he is serving as Director General of PDPU and in-charge Director School of Technology, PDPU. He is also serving as chairman of Academic Council and Finance Committee of PDPU. His service in academics and administration includes responsibilities such as Professor, HOD and Head of centre for Planning and institution Development. Dr. Raghavendra is a Fellow - institution of Engineers and Life member of several organizations like Indian Geotechnical Society, Indian Society for Technical Education, American Society of Civil Engineers, and Indian Earth Quake Society etc. He is heading several teams of Scientists and technocrats who are working under various centers of Excellence in renewable Energy and other initiatives of the university. He is also serving as Director for Sec.25 companies and member of expert panels of Government of Gujarat. He is a very active consultant in the field of geotechnical and structural engineering. He has got special interest in foundations on problematic soils and rehabilitation of structures. He has completed projects sponsored by AICTE and several Industries. He is also a recognized Professional and charted Engineer. His present area of research includes impact of industrial waste on engineering behavior of soils, analysis and design of reinforced soil foundations and ground improvement. He has served as an expert committee (task force) member for various governmental and nongovernmental organizations. He has conducted several AICTE/World Bank sponsored training programme for Engineers of state and central government. Organized several workshops and seminars for faculty, departmental civil engineers and consultants. He has served as coordinator for World Bank programmes on rural sanitation and water supply.